Internet of Things (IoT) technology deployment is maturing across the world. It is predicted that the global IoT industry will grow to $457B by the year 2020 from $157B recorded in 2016. It will attain a 28.5% of Compound Annual Growth Rate (CAGR) by reaching this period. With IoT growth forecasts and market estimates there is a very high level of expectations set for scope, scale, and ROI from strong IoT marketing as well as business initiatives. However, along with IoT gaining momentum, many other applications have been introduced in the market. The biggest challenge for companies providing IOT Development services is the cost that is involved in the development of the prototype. The software integrations with the hardware circuits and mechanical fixtures prove to be very costly and cannot be justified. How can Rapid Application Development affect IoT? Rapid application development is a tool that represents this concept with Visual Basics. Visual Basics was initially built for desktop based applications however over the past few years even the web, and mobile apps have been following the same strategy in the form of various frameworks and libraries for rapid development. This will be of immense benefit to IoT app development companies wherein it can reduce the development risks and simultaneously make the coding and designing task easier. Experienced developers will find it difficult to cope up with Rapid Application Development as they will be compromising on designing flexibility. Also, they would need to focus more on trying new or innovative features that would be a backup strategy to market their products. So, there is always a way out where developers can accept and implement some of the tactics. Utilizing existing resources here in the form of hardware is the age-old approach many companies follow to accelerate their development cycle. They start the development from the prototype stage or an EVK instead of using a chip. A prototype board helps you to get rid of the complexities of hardware designs. The assembly and board make the development process easy. In the hardware, BOM selection step can even be eliminated as you only need to worry about the links interconnected to the boards and not the components. Ultimately, the board becomes your template upon which your software is built. This stuff ultimately helps companies in reducing their hardware development cost, efforts and time. Additionally, if you are going with a stable board backend through a well-known ODM, then you can rest assured of long-term support. With this approach, the overall cost of hardware design, development, and the entire product development life cycle will reduce significantly. This approach is somewhat similar to the one discussed above; however, here hardware suppliers also provide the SDKs and sample applications. Some of the platforms accessible are an all-inclusive suite of software apps which includes the underlying hardware board which is customized for specific usability. At times the configurations are smart enough which enables you to use the software without any modification. A recently hyped product in the similar category is the ST Microelectronics's Sensortile. This smart device is compact and comes with special sensors to make any object smart. The device is capable of sensing motions, environmental parameters, sounds, and other activities. The fascinating feature about this kit is that it comprises of software application packages which transmit the required information as soon as the sensors detect the needed command. This strategy can be used to make any object smart e.g. shoe, where you can integrate this device. With the all-inclusive kit, you can eliminate the hardware product development effort and only jump on to the performance testing phase. COTS exists in the market since ages, you can say since the 80s time. COTS, i.e. Commercial Off-The-Shelf is how the hardware technology evolved years back. Giants like IBM and Intel have played a significant role in standardizing the computer hardware architecture hence the revolution of a personal computer persists. A few years back there was a great invention, or instead, you can call it a revolution in the form of Raspberry Pi. This was a personal computer of the size of a credit card. Many companies have embraced it as a hardware platform and used it while producing the application. The combination of Raspberry Pi and Raspbian OS is a great way to build the application. One of the other ways to build applications is by using tools such as Forward Loops Flop CLI. This is an excellent tool for the developers as virtualization on COTS hardware and OS which makes the software development process more comfortable as well as faster. To determine how this software responds to various devices, developers take the help of embedded Docker images. With this developers only have to create their base operating image one time and they can use rest of their time in writing code for embedded software. Docker images and COTS is a great combination to get rid of differences across devices. In our opinion, there are very few options that seem to be a good match compared to the scalability offered by the traditional hardware. The low to medium manufacturers can materialize these ideas to reduce the overall time and cost of development. Let’s not forget the number of iterations until you get a satisfactory or consumer ready product. 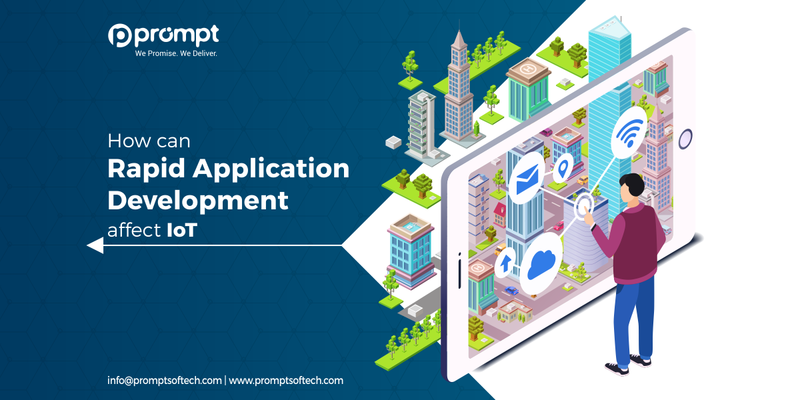 Prompt Softech is a leading Internet of Things (IoT) application development company with both local and global customer base. Our job initiates with IoT consulting to development and implementation for any thorough business aspiration. If you are willing to discuss any of the ideas which you wish to materialize or have a query regarding the functionality of IoT based applications, you are free to reach out an IoT application development company like us. Our team will be more than happy to assist you further with deployment to production along with automated testing.